REVOCATION will return to the road next month as part of the Chaos & Carnage tour. 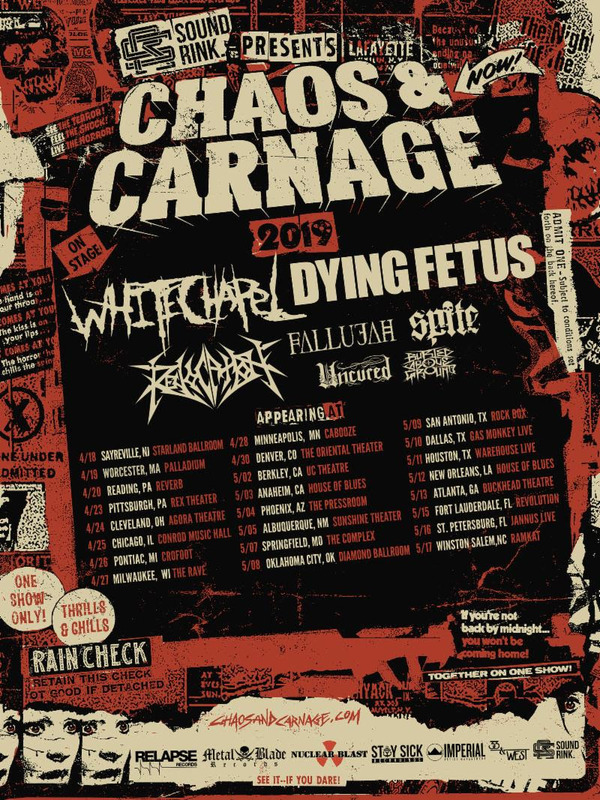 Set to commence on April 18th and run through May 17th, the trek features co-headliners Whitechapel and Dying Fetus with additional support from Fallujah, Spite, Uncured, and Buried Above Ground. See all confirmed dates below. In related news, REVOCATION recently unveiled a new video for “Vanitas” from their latest full-length, The Outer Ones, released last September via Metal Blade Records. “Vanitas” was shot during the band’s European tour last year with labelmates Rivers Of Nihil. Directed by Rivers Of Nihil guitarist Jonathan Topore, the video can be viewed at youtu.be/MeqwJLnNa9Y. Preview and purchase The Outer Ones at metalblade.com/revocation.